Another TrU3Ta1ent upload, another Injustice: Gods Among Us combo tutorial. 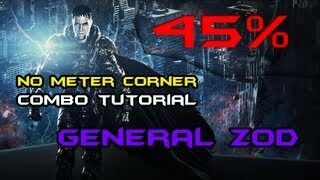 Watch General Zod land a 45-percent meterless combo and find out how it's done inside. Looking for a tip with General Zod in Injustice: Gods Among Us? Look no further than TrU3Ta1ent. He has gone to the lab with Superman's fierce rival to provide a tutorial on this meterless 45-percent combo.